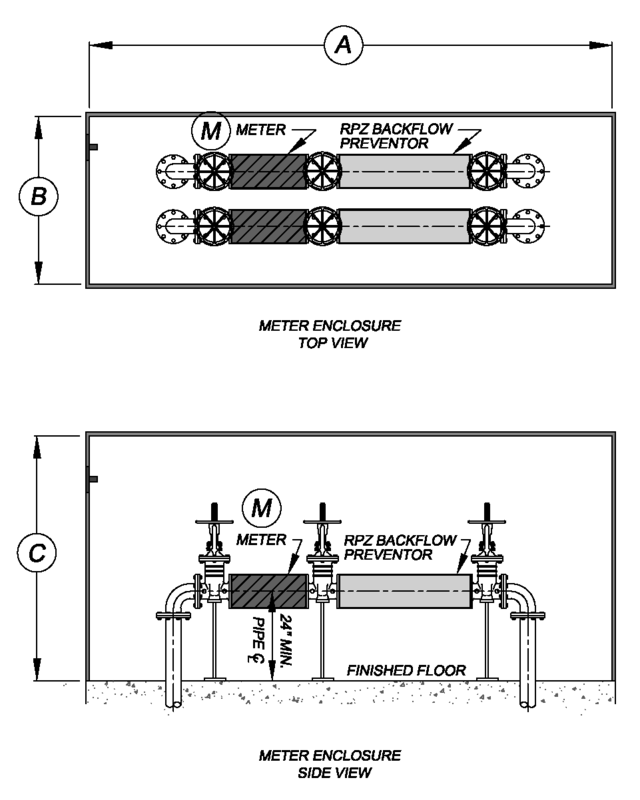 Most commercial projects require two to three backflow preventers on each job site. You will generally need a backflow preventer for the irrigation system, another backflow preventer for domestic water, and yet another for the fire protection system. 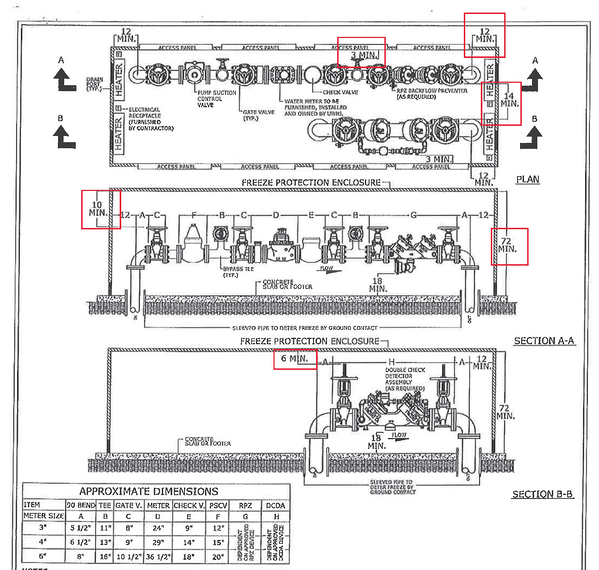 Often, one design engineer chooses the design and location of both the domestic and fire protection lines. They'll either specify them indoors, in a vault, or in an aboveground backflow enclosure as is best practice. Usually, the irrigation water piping is designed by a different discipline. It's most common for a civil engineer to specify a backflow enclosure for each device, but what about putting them both into only one aluminum enclosure? Many designers are choosing to do this with success and we recommend you try it as well. Some say there are disadvantages to designing both backflow devices in a single enclosure, and there are certainly benefits. Let's break it down. Some have argued that if there are more devices in the enclosure, there will be problems with accessibility. The good news is that you will not have less accessibility by housing multiple backflow preventers inside a single enclosure. This is mostly due to Safe-T-Cover’s panel design. Our enclosures have an access panel on each of the two longest sides for easy accessibility to each of the backflow preventers. If that doesn't quite cut it for your situation, we can build a custom enclosure to your exact dimensions with wide access panels placed exactly where you need them. Additionally, our roof panels are also easily removed for total top accessibility. All you have to do is back out a few of the roof panel screws to remove it. If a removable roof isn't the best choice for your situation, you can request a hinged roof panel for easy accessibility from above. We've also heard some argue that the enclosure required for two backflow devices would be prohibitively large. Fortunately, the enclosure must only be wider than usual. The length and height will stay the same as they would be for the larger of the two backflow preventers. That makes the sizing not a downside, but actually an advantage. What makes the sizing such an advantage? 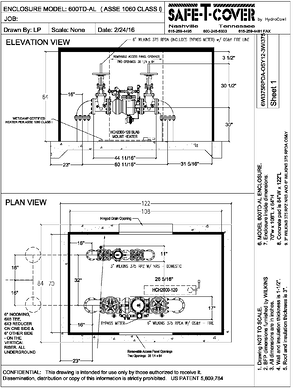 Placing two or three backflow preventers inside a single, wider enclosure costs 15% to 25% less than the cost for using separate enclosures for each backflow preventer. The cost advantages are even greater when housing complicated water piping systems that include PRVs, strainers and meters. In addition to the cost savings, you'll also get improved aesthetics. One big shiny box is definitely better than two. With a single enclosure, it's also easier to add landscaping and to place it in a less visible area. Some areas have recognized these benefits and specifying dual backflow preventer systems has become common. 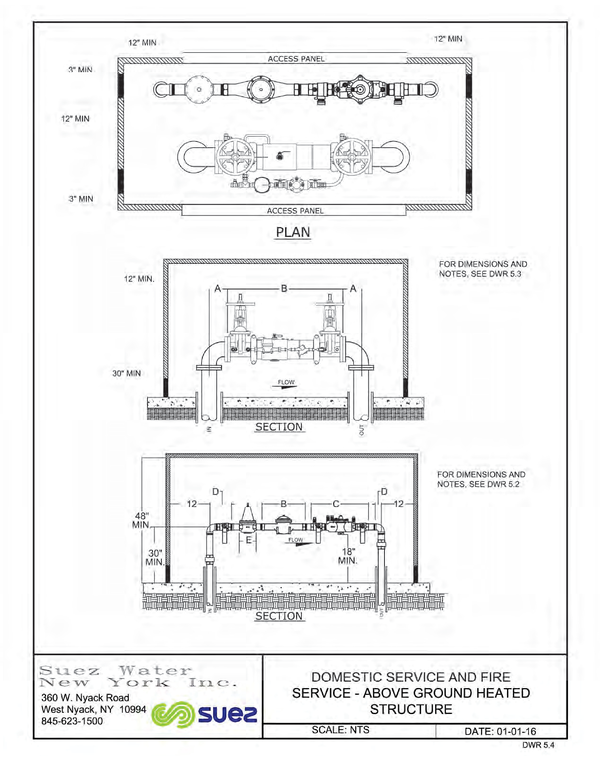 Some water jurisdictions have even published standard drawings for specifying engineers to follow. You can see an example below. Many civil engineers are finding that it is more economical to place two of their site’s backflow preventers inside one enclosure, instead of a separate enclosure for each application. Most architects will also agree a single enclosure is aesthetically more pleasing than having multiple enclosures on the same job site. 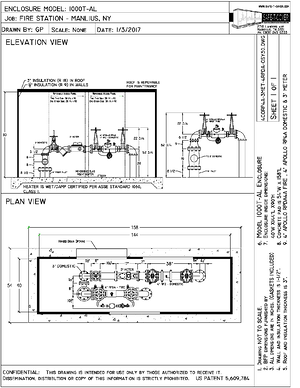 The visual profile from the street looks the same (length and height) for a wider backflow preventer enclosure as an enclosure designed for only the largest backflow preventer. The best part is that you'll typically save money choosing to place two devices in one aluminum enclosure as well. Think about that the next time you are designing the water systems for your entire job site. Bring the water piping together on the civil plans so that you get the advantages of multiple backflow preventers inside a single enclosure.